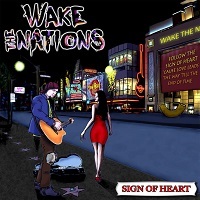 WAKE THE NATIONS is mainly a Soft Hard Rock project, with a strong characteristic, which is to be stuck in a Melodic-Nostalgic tendency. The core of the band is hailing from the mighty Finland but they are helped in their task (“Until The End Of Time”) by a bunch of guest musicians and artists from all over the globe (from Croatia for Mr Dado Topić to Ecuador with Miss Estef Martinez). Each track reveal a new facet of their sound even if the respect for the traditional Melodic Radio-Rock style of the 80's and the professionalism are the common denominators for the whole disc. From the typical Scandinavian AOR (“Fairytale Romance” feat. Krister Stenbom (VILLA SUCKA)) to the More Mainstream Euro Rock (“This Feeling”) to some Modern Sounding West-Coast like the song “Love Distracts The Senses” with Janne Hurme (frontman for HUMAN TEMPLE) , every parcel of this easy-listening genre is covered with success, enhanced by some sing along catchy hooks and contagious chorus. Some tracks are built in a Keyboards driven direction (“Love Leads The Way”) others are luckily more guitar oriented (“So Broken”) while some are clearly crafted in a commercial targeting purpose (“All I Want”), the diversity is a double edge sword because at the end of the day, it’s not easy to create a mental picture of this “Sign Of Heart”. The production handled by the band is first class while the mixing was done by Kari Nieminen in Noisecamp Studios and the mastering job by Joona Lukala. I think that if the technical side is flawless some more creative edge could have been added to reach the full intensity of the contemporary AOR method…The more conservative part of the Melodic Rock audience will praise this album while the rest (as myself) could have been set in a frustration mood, and maybe wishing for more density or Heaviness for the next one.